BEIRUT — Palestinian Umm Aziz was an 18-year-old newly-wed when she fled to Lebanon from her native village of Sheikh Daoud, in what is now Israel, when the Jewish state was created in 1948. 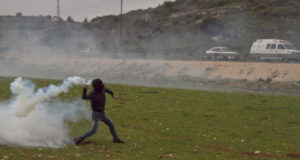 On Friday, Umm Aziz marked what is known as Land Day, observed each year since six Palestinians were killed in clashes with Israeli forces, following a government decision to expropriate land in Galilee in 1976. Umm Aziz still holds to her dream of one day returning back home. “In 1948 I fled my village on foot, and I know I would go on foot if I had the chance to go back,” said the 76-year-old woman, who lives in a modest house in the refugee camp of Burj Al Barajneh, south of Beirut. Resting on a cane, the veiled woman insisted on marching in the small ceremony to mark Land Day at the camp. Umm Aziz is among 400,000 refugees who are registered in Lebanon since Palestinians fled or were driven from their villages in a mass exodus in 1948. Many Palestinian refugees marched in the Land Day ceremony, carrying the keys of their houses and documents of property ownership. Palestinian refugees cling in hope to a peace proposal that Arab leaders revived at a summit in Riyadh this week, which offered Israel normal ties if it withdraws from all land occupied in the 1967 war, allows the creation of a Palestinian state, and the return of Palestinian refugees. But Umm Aziz, who left Sheikh Daoud with only the clothes on her back, regrets now that she fled. Her life has been a series of tragedies. Umm Aziz’s four sons went missing September 17, 1982, a few days after a massacre at the Sabra and Shatila refugee camps during the Israeli invasion of Lebanon. And her husband was killed in a shelling in 1986, at the height of the Lebanese civil war. But her ordeal started much earlier. She said her mother and father were killed in an Israeli shelling of their native village. “If I had the power to see the future and know that four of my sons would be taken from me, and that my husband would be killed in a mortar attack, I would have preferred to stay behind and be killed with my parents,” said the tearful woman. 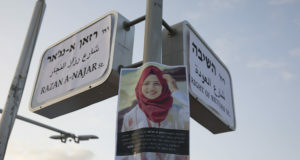 “There [Israel] when someone is arrested or put in jail, at least we can know his whereabouts, but here [in Lebanon] I have been searching for my sons for 24 years without anyone being able to confirm whether they are dead or alive,” she bitterly added. The woman recalls the painful day when her four sons were taken. “We were having lunch at home on that day, when armed men broke in and took my four sons. They put them, along with scores of young Palestinian and Lebanese men, in a truck that had the sign of the Lebanese army,” she said. “The truck just left, and I don’t know anything about them ever since. The eldest was then 30 and the youngest 13,” she added. Black and white pictures of Umm Aziz’s four sons adorn the walls of her two-room apartment in the camp, which had witnessed the fiercest of battles in the so-called “camps war” between Palestinian fighters and militants of the pro-Syrian Lebanese Shiite Amal militia in 1986. “We survive like plants which grow in the wilderness, without watering. But these plants die slowly, with no hope of a better future,” she said, sitting amid a few grandchildren, some of them smoking a water pipe in the small yard outside her apartment. “Many of these kids grew up without knowing their fathers, and they will die without knowing Palestine,” she added.